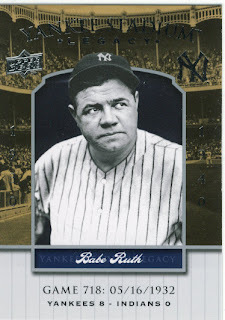 For some reason when I look at that Ruth card, I feel like he is looking up at someone doing something really annoying and possibly mumbling something under his breath. I put together a package for Charlie that went out yesterday, and I think he will like it just fine. I included only players that he had on his want list, and I hope he doesn't have them. 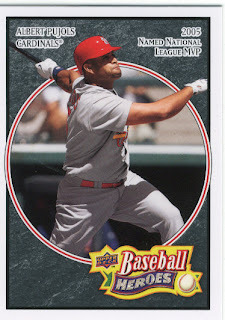 One of the cards that I sent I absolutely loved because it is one from a subset that is so hard to find, and I am sure he will appreciate the card once he sees it. Make sure you stop by Charlie's blog, his want list is very player specific and he is a great guy to trade with. Thanks for the link to another excellent card blog! It's amazing how many great blogs are out there, it seems I'm adding a blog or two to my blog roll every day, usually thanks to posts like this! Not a big fan of the BB Heroes set, but I really like those Charcoal cards. PS: I think I'm officially in lurve with UD Spectrum now after seeing them up close.